The next time life hands you lemons and about 12 minutes to cook dinner, remember the first of these two recipes. When life says “you know what? I can’t even give you the lemons today” then you’ll need recipe #2. Both can be made in the time it takes the pasta to cook and with ingredients you probably have on hand all the time. They are probably not going to change your life but I promise you one day you will need them and they are very good, quick, weeknight, meat-free, kid-friendly meals. My one word of caution is to make sure you finely grate the cheese in both recipes. It will inevitably clump a little bit in my experience, but it will help a lot to start out with very fine parmesan. 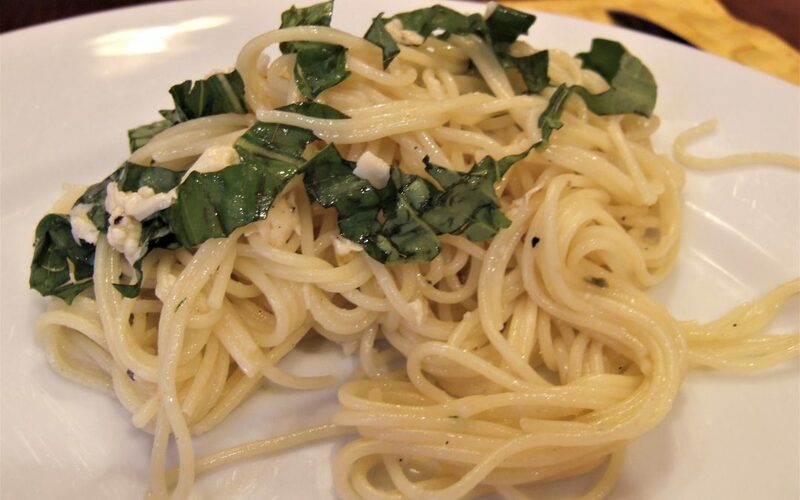 You can find the Spaghetti Limone Parmeggiano recipe here on Epicurious. Made this since it sounded delicious for my pasta hungry children on a hottish day. First, they thought lemons in pasta wasn’t a big seller. Then I got to the clean up part, which was a bear. GP (whose recipes I have been intrigued by and liked) obviously isn’t doing the dishes when they are coated with a shell of melted on parmesan cheese goo. That, and the fact that I couldn’t sell the reheated leftovers to my children (who normally are big reheated leftover pasta fans), means that this is one recipe I will shelve. But I have been working through the cookbook and I completely agree with you about those kale chips!